The Derivative or What's the Slope of Your Surfboard? Now that we've discussed tangents and limits, (see "What's a Tangent?" and/or "The Y's the Limit" ) we can investigate the derivative. Differentiation first appeared on the mathematical horizon when Isaac Newton and his mathematical buddies were seeking a way to find an expression and/or a value for the slope of the tangent to any curve at any point on that curve. They realized that the ability to evaluate the slope of the curve at any point would allow them to determine where the curve was increasing, decreasing, at a max or min value without actually analyzing the curve's function. Here's what they did. They realized, with a little help from Descartes, that the difference between the slope of a secant and the slope of a tangent was simply a matter of limiting to zero the horizontal distance between the two points of contact with the curve, thus turning the two points into a single point. The question now is how to make this the slope of a tangent instead of the slope of a secant. What we really need is to make the 2 points of intersection into a single point. We do this by limiting h, (the horizontal distance between the two points) to zero -- since it is distance h which causes the points to be different and discrete. When we take the limit from the right as h t 0 + , for the slope fraction above, we're moving point B into point A, so we're finding the slope of the tangent to y = f(x) at point A. If we collapse the horizontal interval by moving point A towards point B, which is taking the limit from the left (limit h t 0 - ) we get the slope of the tangent at point B.
so we find an expression which represents . when we cancel the h and set it = 0. This says that the slope of the tangent at any point of contact will be twice the x coordinate of the point minus 8. So the slope of the tangent to this curve at P( - 3, 48) is 2( - 3) - 8 = -14. Let's look at an image of our parabola to investigate what this derivative expression is saying about the slopes of the tangents to the curve. Keep in mind that the tangent line is just the surfboard riding the curve of the wave and the derivative is the slope of that board. y = x2 - 8x +15 is a parabola opening upwards. 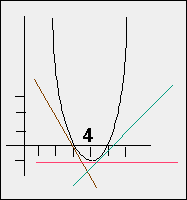 When factored as (x - 3)(x - 5) it becomes obvious that the curve crosses the x-axis at (3, 0) and (5, 0). negative when x < 4, since 2x - 8 < 0 when x < 4. Now let's consider what happens at x = 4. The slope of the tangent is = 0. Let's recall that a line with slope = 0 is a horizontal line. Well, isn't the tangent to our curve horizontal at the point where x = 4? Yes indeed it is. Now, we get into x-values that are > 4. All tangent slopes are now positive since the lines all rise to the right. The question now is how do we distinguish maximums from minimums since both make the derivative equal to zero? We look at what the derivative's sign is left and right of the critical point. If the derivative is positive left and negative right of the critical point, then we must have gone through a max, since our curve first increased, then flattened and then decreased. In surfboard terms, we climbed and then crested the wave. The opposite is also true. So if our derivative goes negative, zero, positive as we move past the critical point, we must have gone through a min, since the curve decreased, flattened then increased. We surfed the trough of the wave -- descended, flatened then climbed. 1) on intervals where f ' (x) > 0, f(x) is increasing. 2) on intervals where f ' (x) < 0, f(x) is decreasing. 3) points which make f ' (x) = 0 are critical points -- either a max, a min or a point of inflection. if your board is flat you're on the crest or in the trough. So, as you can see, we can easily determine the shape of a curve by studying the signs of its first derivative also known here as the slope of your surfboard. Next time we discuss the second derivative and its role in the shape of the curve.